Can dogs eat green pepper? The answer is yes they can. In fact when we have cooked roasted stuffed green peppers, our dog Bobby can smell it a mile off. He comes sniffing straight away. Not only does he enjoy the green pepper, we give him a little of the mince too. However, as with any prepared for human foods that you offer your dog, you do need to be careful. In the instance of the stuffed green peppers, we always ensure that there is one for him that does not contain any onions and flavorings with the mince. Also, that it is suitably cooled before we feed him any. However, I digress. This is an article about whether dogs can eat green peppers, (or red and yellow peppers for that matter), and whether it is any good for them. Can dogs eat green peppers – Any benefits? 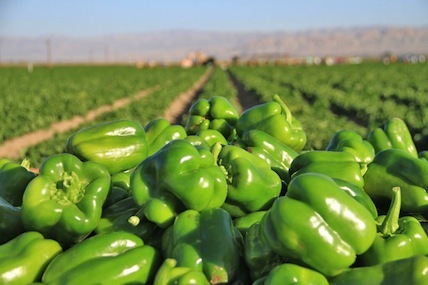 Green peppers are actually a good source of vitamin C. They are also an excellent source of beta carotene. This substance is found in many vegetables and one of the reasons you should ensure that although most dogs love their meat, you should serve up a good percentage of vegetables too. The beta carotene found in green peppers can actually help prevent cancer. It is also linked to a reduction of cataracts and other eye issues within ageing dogs. Furthermore, studies have led researchers to believe that beta carotene can also help prevent arthritis for your dog. Green peppers are not toxic to dogs, so there is no precautionary measures that need be taken there. However, experts do state that dogs do digest vegetables less efficiently than us humans. 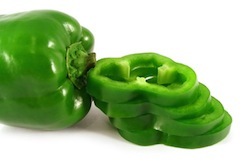 Green peppers have quite a tough outer skin if eaten raw. A dog will not necessarily be able to breakdown the cell walls of the vegetable in order to absorb all the goodness it contains. Again, this is the case for many vegetables a dog is able to eat. Because of this it is recommended that you either puree or cook green peppers before serving. (As I have already stated, our Bobby makes short work of the roasted stuffed green peppers – however, the fact the center holds some delicious minced beef might have something to do with it). From a nutritional perspective, pureeing is actually better than cooking as all the essential goodness is maintained. Your dog will be able to absorb more of the nutrition this way. It will also help prevent any potential tummy discomfort as the peppers will be easier to digest. Another caveat I would like to add is that of amount. As I often state – feeding your dog foods that he is not used to needs to be done in moderation. Never introduce a new food quickly and in large amounts. Your dog can eat green peppers, and red and yellow peppers, however if it is their first time, only give them a little bit. And if you are able, puree first. Wait and see how they react. If there are no adverse effects and your dog sniffs interestedly next time you offer the food, you know you are okay. Can dogs eat green peppers? If you have any comments on your own experiences with feeding your dog green peppers please leave them below.